When I was younger, I used to help my parents make dumplings. About twice a month, they’d take out the huge wooden board, dumpling wrappers, home-made pork filling, and methodically wrap them, each one looking exactly like the one before it. I remember for our elementary cultural carnivals, where each student would bring food from their country of origin, our dumplings would be the first to go. Making dumplings is definitely a communal or family activity. Usually, we’d set up little stations. Since I was the most useless, I’d always end up being the one lining the dumpling wrappers with water so they’d stick when my mom or dad wrapped them. Once in a while, I was allowed to try my hand at wrapping one, but it’d always come out so ugly that I’d give up and go back to my original station. This past Chinese New Year, I was especially homesick and decided that I’d not only make dumplings, but I’d go further than my parents ever did and make them completely from scratch, skins and all. The process was surprisingly simple, just flour and water with a little salt mixed together, and rolling out the individual skins became quite meditative, even though I’d occasionally freak out about the Chinese BBQ ribs in the oven. I stuck with the filling that I’ve been eating since I was a kid – pork and leek. Except I didn’t have any leeks so I used scallions instead, and they still turned out great. Until recently, we always used to boil dumplings at home, but lately, my dad (maybe it’s a regional thing? He’s from southern China and my mom’s from northern) likes to pan-fry them. And I’m a huge fan of anything with golden crusty bottoms. Mix flour, water and pinch of salt and knead to make a soft dough. Cover for 20 minutes with a damp paper towel. Knead dough on a floured cutting board and form a flattened dome. Cut into strips about 2 inches wide. Shape each strip into a round log, and cut into 3/4 in. pieces. Press palm down on each piece to form a flat circle, and with a rolling pin, roll out a circular wrapper. Line the outer edges with water using your finger. Take 1 tablespoon of filling and put into the center of the wrapper, fold in half, and pinch. 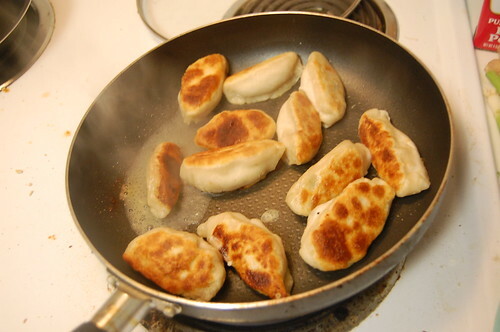 Place dumplings in a fry-pan with 2-3 tablespoons of vegetable oil. Heat on high and fry for a few minutes until the bottoms are golden. Add 1/2 cup of water and cover. 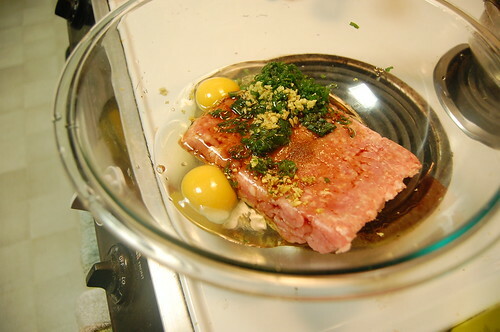 Cook until the water has boiled away, uncover, and reduce heat to medium or low. Let dumplings cook another 2 minutes and then serve. I like to serve my dumplings with a dipping sauce – soy sauce, sesame oil, chili oil, rice wine vinegar, minced ginger, scallions. You are currently reading Making our own dumplings at Notes on Food.